We like to use Mule Corners, rather than wood posts, for corners. They are easy to install and they last indefinitely. It’s as easy as (1) screw in three augers, (2) secure fiberglass corner post and two braces to the augers and (3) install line posts and add the wire. A Mule tool is available for installing the augers. Mule corners come in 4’, 5’ and 6’ heights, with 5’ being the most popular. A 4’ corner might be used for pigs and 6’ corners are traditionally used around orchards or Christmas tree plantations to help keep deer out of the plantings. 5’ corners work for cattle, sheep, goats, horses, etc. This makes a permanent fence, but if you need to move the fence the augers can be backed out of the ground and used again. 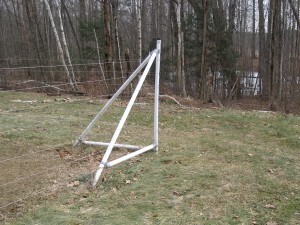 The corner posts and braces fit over the auger shaft and then are tightened with stainless screws. The braces are set in at an angle making a durable and sturdy corner. For a gate, install an End Assembly which is the same as a corner, with only one brace. Usually a Gate Brace should be added for extra strength if hanging a metal or wooden gate. Augers are made of steel and come in 4”x24”, 6”x36” and 10”x36” sizes. In sandy or wet soils, an extension is sometimes necessary and in the case of vineyards which exceed the normal working load, the larger augers may be necessary. An additional plus, frost does not heave the Mule corners out of the ground. 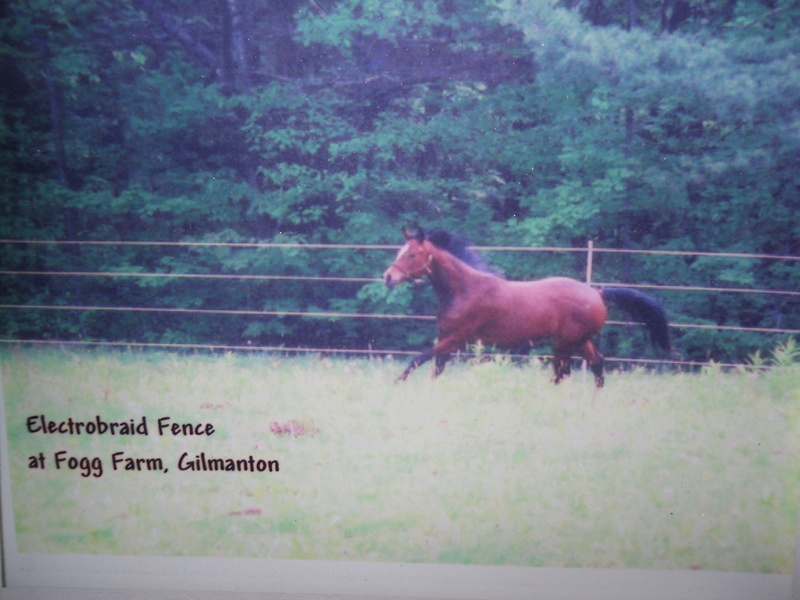 Electric fence is easier to install, safer for animals and less expensive than many other types of fencing. “Easier to install” is one of the reasons we use aluminum wire as it has greater flexibility than steel and is 1/3 the weight. 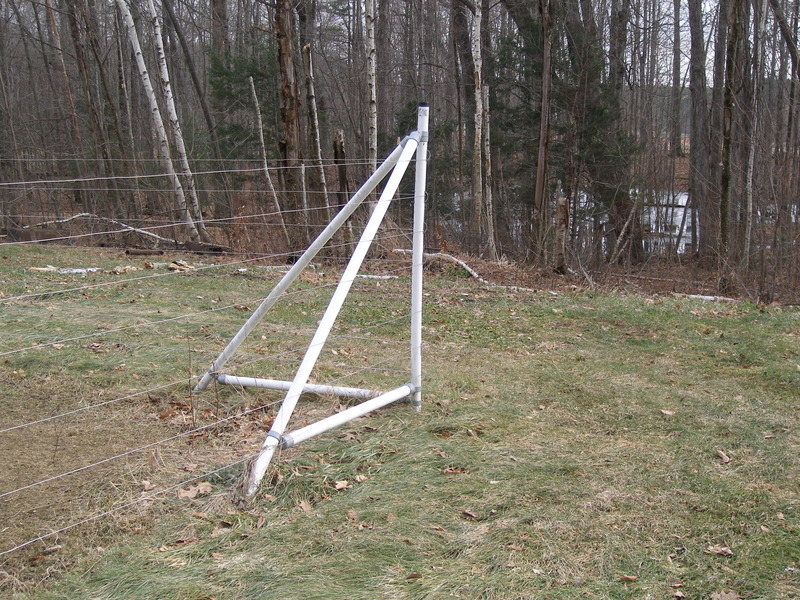 Electric fencing is also less expensive since there are fewer parts and pieces to it: posts (at least 25’ apart depending on the terrain), insulators (type of insulator depends on the type of post being used), Gripples and, of course, the energizer and related materials. 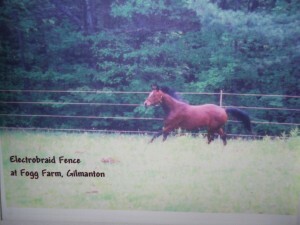 An electric fence does not require expensive equipment to install. It is unobtrusive. It can be run along an old stone wall and not detract from the beauty of the stone wall and its surroundings. With green posts and aluminum wire, it is barely visible. But the animals (inside and outside the fence) will know it’s there. We have seen these fences containing horses, buffalo, cattle, llamas, alpacas, pigs, sheep and goats, dogs, poultry and the fences are used to keep out deer, bear, coyote, fox, turtles,etc.